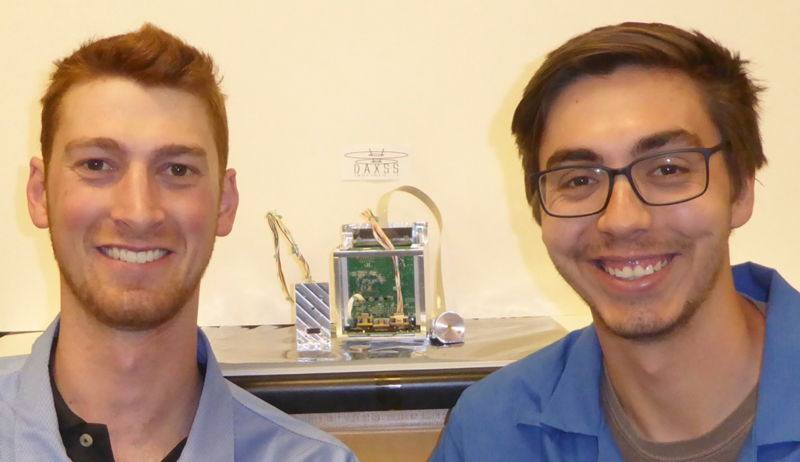 In the wake of an unfortunate event, two University of Colorado (CU) graduate students have accomplished a remarkable feat in space science: they’ve designed and built a new satellite instrument in less than three months. LASP graduate students Bennet Schwab (left) and Robert Sewell pose with their DAXSS flight unit. Image Credit: CU/LASP. Bennet Schwab, a graduate student in CU’s Aerospace Engineering Sciences department, and Robert Sewell, a graduate student in CU’s Physics department, have been on an emotional roller coaster ride over the past few months. One extended peak in that ride came during the preparation and launch of the NASA Miniature X-ray Solar Spectrometer (MinXSS-2) CubeSat on December 3, 2018, and the subsequent successful observations of X-rays from the Sun. This initial success was soon followed by a setback, when there was a loss of communication with the CubeSat on January 7, 2019. The students didn’t have to wait long for their next ascent, however, as a new opportunity arose in late January to provide a small instrument, similar to MinXSS, for CU’s INSPIRE satellite education program. In less than three months, Schwab and Sewell, along with professionals at CU’s Laboratory of Atmosphere and Space Physics (LASP), developed a new instrument concept, designed and built the instrument, and now have it ready for integration on the INSPIRESat-1 small satellite. They have named this new instrument the Dual Aperture X-ray Solar Spectrometer (DAXSS). Sewell also worked on the operations and science analysis of MinXSS-1 after its release from the International Space Station in May 2016 and until MinXSS-1 re-entered the atmosphere in May 2017. MinXSS-2 was designed for a longer mission by being in a polar orbit with higher altitude, and there was great excitement among the MinXSS science team for extended observations. Unfortunately, the polar orbit has a more intense energetic particle environment and MinXSS-2 experienced issues with the onboard electronics every few weeks. The team addressed previous issues by power cycling the electronics, but MinXSS-2 has not properly recovered from the January 7 event. Attempts to recover MinXSS-2 are ongoing, and continuation of solar X-ray research is now being pursued with an opportunity to fly DAXSS on the INSPIRESat-1 small satellite. The International Satellite Program in Research and Education (INSPIRE) is a consortium of global space universities, led by LASP, and formed to advance space science and engineering. Each INSPIRE small satellite will proceed from concept to flight in three years, providing the opportunity for undergraduate and graduate student involvement in small satellite design, building, testing, and operations. INSPIRESat-1 is scheduled to launch in early 2020 and partners include CU Boulder, the Indian Institute of Science and Technology, National Central University of Taiwan, and Nanyang Technological University in Singapore. 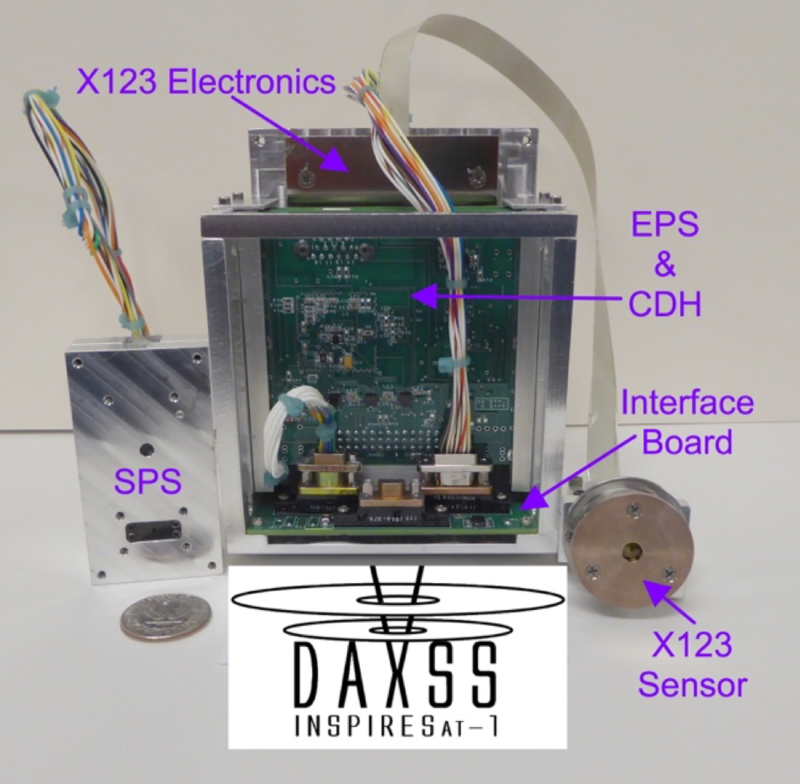 Shown here is an image of the DAXSS Flight Unit. The SPS and X123 Sensor mount on the solar side of INSPIRESat-1. From discussions with Amal Chadran, LASP program manager for INSPIRE, the MinXSS team learned about an opportunity on INSPIRESat-1 for a 1 Unit (10 cm x 10 cm x 10 cm) instrument, which had to be completed by May 2019. Schwab and Sewell jumped at the opportunity to extend the solar X-ray observations on INSPIRESat-1 by building up a new satellite instrument and incorporating into it their solar X-ray spectrometer that flew successfully on a LASP rocket in June 2018. Schwab and Sewell developed an innovative solution for extending the X-ray range for their rocket-tested spectrometer by including two apertures with different X-ray filters and a single detector. DAXSS also includes the backup Command and Data Handling (CDH) processor board left over from MinXSS-2 development. The students had to design and build a new interface electronics board, an Electrical Power System (EPS) board (based on MinXSS-2), a new Solar Position Sensor (SPS) for tracking solar location during flight, a new mechanical design to accommodate these DAXSS subsystems, and they had to update flight software from MinXSS-2 for the DAXSS configuration. Schwab and Sewell built two DAXSS instruments, one for flight and one for use in early integration with INSPIRESat-1, as well as for later use in any post-flight testing of DAXSS software.